H. Rider Haggard’s She, published in 1887, is one of the bestselling novels of all time. It’s unquestionably one of the great adventure novels. Given its enormous success it’s hardly surprising that Haggard was tempted to produce a sequel in 1905. The result was Ayesha - The Return of She. Since it’s a sequel and given that there may be those who have not read She, I’ll say as little as possible about that novel. Suffice to say that Ayesha begins with a prologue in which the author receives another manuscript from Horace Holly, a manuscript that describes the extraordinary adventures of himself and his one-time war and close friend Leo Vincey in central Asia. Leo had seen a vision, and was convinced that it was sent from Ayesha, the beautiful and mysterious She-Who-Must-Be-Obeyed who played such a central role in his earlier manuscript. Holly and Leo set off for Asia. After years of wandering they believe they are finally close to their objective, somewhere in the Himalayas. Before finding Ayesha, they find Atene (who also figures prominently in She). Atene has been watching and awaiting his arrival. She and her physician-sorcerer Simbri have the power of foretelling the future, at least in part. Atene knew that Leo would come and she believes that he is the man for whom she is destined. But Leo is interested only in Ayesha. He will find her, but she is unrecognisable. Despite this, he knows that this is indeed Ayesha. Ayesha will reveal herself to be possessed of powers even more extraordinary than those she wielded in the first novel. Is she an angel? A witch? A goddess? At the end of the story Holly has to admit that he still isn’t sure. Ayesha is very much a larger-than-life character. She sees no reason why she should obey any of the rules that others must obey. She is throughout the story morally ambiguous. She’s not evil, although she is capable of cruelty and yes, even capable of evil acts. She is capricious and she never apologises for anything she has done. Except, perhaps, to Leo. The love between Ayesha and Leo has a truly epic quality, spanning the centuries. Eastern beliefs in reincarnation play a major role in this story. Ayesha’s own religion remains a mystery - she expects to receive worship rather than to offer it. Again, except perhaps from Leo. The novel offers plenty in the way of adventure, as Holly and Leo battle almost insurmountable odds in order to find Ayesha. Even nature seems to be against them, and yet nothing can stop them from going on. The major fascination of the tale is Ayesha, She-Who-Must-Be-Obeyed. The author’s own feelings towards his fabulous creation seem at times to be a mixture of awe and horror. Haggard’s work is more complex than is usually admitted, and this is more than just an adventure story. It is, if you like, a kind of philosophical and spiritual adventure story. Perhaps it’s not quite in the same league as She, but then She was a very difficult act to follow. Still worth a read for lovers of Victorian adventure. Arthur B. Reeve (1880-1936) was an American writer of detective fiction. He is best-known as the creator of Professor Craig Kennedy, “the American Sherlock Holmes.” Reeve wrote no less than 82 Craig Kennedy stories. I’ve been reading a few of these Craig Kennedy stories that I have scattered about in various anthologies. Kennedy was also known as the “scientific detective” and what’s interesting is that it’s not just that his methods are scientific - science itself plays a key role in the stories, at least in the ones that I’ve read. In The Black Diamond, which involves the theft of a very large diamond and a murder, Kennedy will need to call upon his knowledge of snakes and snake venoms. In The Black Cross his knowledge of bacteriology and infectious diseases will be vital. In this story the professor stumbles across a fiendish conspiracy of gigantic proportions. In The Invisible Ray he confronts an inventor who claims to have discovered the secret of transmuting base metals into gold. More than that, this modern-day alchemist claims to have penetrated the secrets of life and death. Fortunately Kennedy’s knowledge of chemistry and of the mysteries of the various visible and invisible rays of the electro-magnetic spectrum are equal to the challenge. The stories are somewhat on the far-fetched side, perhaps even at times flirting with science fiction. Kennedy himself is a rather colourless character - it’s the extraordinary breadth of his scientific knowledge that makes the stories interesting. Reeve started writing the Craig Kennedy stories in 1910. His later stories, written in the 20s and 30s, apparently see him moving closer to the hard-boiled school with gangsters taking over the spotlight from eccentric alchemists. The scientific background gives Reeve’s stories a distinctive flavour of their own. He’s worth further investigation. 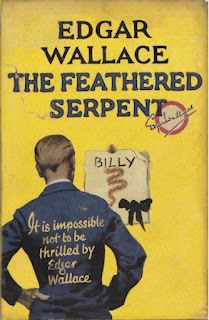 Edgar Wallace’s The Feathered Serpent is a typical Wallace thriller, and as far as I’m concerned there’s nothing wrong that. It has murder and it has secret societies and old grudges that demand to be settled. A number of people receive threateningd cards emblazoned with the device of a feathered serpent, a device that we later find is associated with ancient Aztec religion and with a cult that still exists in Mexico and Central America. While they try to make light of it they are obviously deeply disturbed, and they just as obviously have some idea of the significance of the device. But they’re not telling. Reporter Peter Dewin tends to be sceptical of the existence of secret societies but he can’t help being intrigued. My Leicester Crewe, a mysterious financier, the origin of whose fortune is unknown, is one of the recipients. Another is publican Joe Farmer, while the popular actress Ella Creed also received one. There’s also Mr Crewe’s friend Paula Staines, who obviously knows what these cards mean as well. During the course of his investigation Peter Dewin makes the acquaintance of Leicester Crewe’s private secretary, Miss Daphne Olroyd, and is clearly rather smitten with her. Miss Olroyd is anxious to change jobs and she takes a position with Mr Gregory Beale. Beale is a typical upper-class socialist with romantic notions about improving the lot of the poor. He’s a multi-millionaire and has given much of his fortune away to the poor although he’s still a very rich man. He lived along the poor under various assumed names, which probably helped to dispel his romanic ideas about them. He then retuned to his first love, the study of the ancient cultures of Central America. He has just returned to London after spending several years on archaeological digs there, with a load of Aztec and Mayan artifacts (including numerous statuettes of feathered serpents). In due course he will also receive one of the threatening cards. Dewin will discover the existence of a large-scale forgery ring several years ago and suspects that it has something to do with the recent events. One of the criminals in this ring was William Lane, now deceased. Or is he deceased? Leister Crewe certainly hopes so. Dewin will pick up leads from several ex-convicts and will discover that the Feathered Serpent seems to be some sort of secret society flourishing in His Majesty’s prisons. The Feathered Serpent case will eventually lead to murder and two kidnappings. It’s the sort of thing that Edgar Wallace did supremely well. It hardly qualifies as believable but Wallace had a knack for spinning these outrageous yarns and making them seen plausible. He was also unfailingly entertaining. There are plenty of breathless thrills and a conspiracy that seems to deepen by the day. There are plenty of colourful characters nine of whom are quite what they appear to be. Edgar Wallace (1875-1932) was an incredibly prolific and extremely popular author, writing no less than 175 novels. He was even more popular on the Continent than he was in Britain and his books have been adapted for so many movies that it’s almost impossible to keep count of them, but the number certainly exceeds 160. 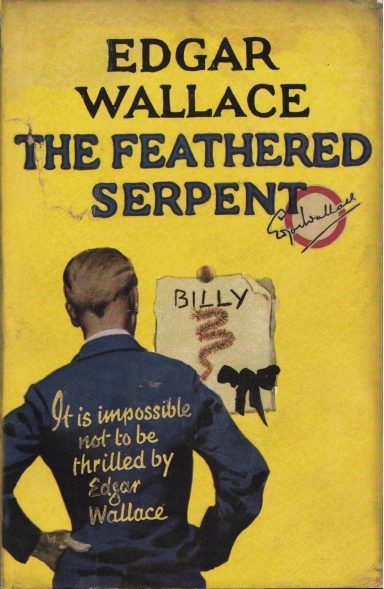 The Feathered Serpent was originally published in 1932, not long before Wallace’s untimely death. It’s all great fun and Wallace keeps the action moving along swiftly, as he always did. Wonderful entertainment and highly entertaining. If you haven’t discovered the joys of Wallace’s thrillers there is a good place to start. Highly recommended. Sexton Blake is sometimes seen as a Sherlock Holmes rip-off but in fact the similarities between the two fictional detectives were purely superficial. Right from the start the Sexton Blake stories were pitched at a younger audience, the readers of the many boys’ magazines that flourished from the late 19th century up until about the middle of the 20th century. And the Sexton Blake stories, at least in the character’s heyday, were more a combination of crime and adventure stories rather than straight detective stories. The Sexton Blake stories can be seen as a kind of down-market juvenile version of the thrillers of Edgar Wallace and Sapper. There were literally hundreds of Sexton Blake stories, written by a variety of authors. The very first of these stories was The Missing Millionaire, published in 1893. It was written by Harry Blyth, an author who was foolish enough to sign away all rights to the character when he sold the story to the boys’ magazine The Halfpenny Marvel. Blyth went on to write several more stories featuring the character before his death in 1898. The Missing Millionaire is not a particularly good story. The plot rambles about all over the place without ever really going anywhere, the style is on the dull side and the character of Sexton Blake had not yet been fully established. The Missing Millionaire is included in David Stuart Davies’ mammoth anthology Vintage Mystery and Detective Stories. Davies also edited Wordsworth Editions’ Sexton Blake collection, The Casebook of Sexton Blake. Davies had a multitude of stories to choose from and he’s come up with seven highly entertaining stories. The stories were mostly novella-length, and that’s the case with the seven selections in this volume. 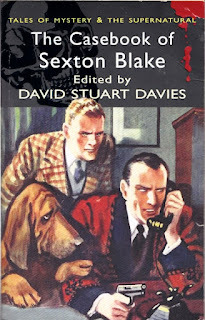 Davies’ own preference is for the more outrageous Sexton Blake tales, with an emphasis on diabolical criminal masterminds and sinister conspiracies, and with delightfully far-fetched plots. I read several of these stories a few years back and I’ve now returned to the scene of the crime as it were to read the remaining stories. A Case of Arson was written in 1917 by Robert Murray Graydon (whose father William Murray Graydon also wrote Blake stories). This story features Dirk Dolland, known as The Bat, a glamorous super-criminal but one who abides by the rules of fair play. He loves crime but he abhors violence. Crime is a hobby for this rich young man and with the assistance of three other arch-villains he is about to pull off the greatest coup of his career. At a gambling hell in London he learns that an American millionaire is trying to buy a famous painting and has offered no less than a hundred thousand pounds for it. A hundred thousand pounds makes a tempting target for any ambitious burglar but merely to steal it would not be a sufficient challenge for The Bat. His nimble mind has conceived an incredibly audacious plan whereby his gang stands to net three times that amount. The plan is complex and brilliant, but The Bat will be going up against the great detective Sexton Blake, a man whose genius matches his own. The Black Eagle was written by G. H. Teed in 1923 and it’s another fine story. Twenty years earlier an English artist had been sentenced to life imprisonment on Devil’s Island for a murder committed in Paris. The murder took place among a set of wild young painters and their models. Now the man is free, and in London. And he’s looking for revenge. He believes that his so-called friends in those wild days framed him for the murder and he intends to kill them all, one by one. Only one man can stop him, and that man is Sexton Blake. To appeal to their young readership base Sexton Blake had, some years earlier, been given a young assistant named Tinker. He’s a sort of Robin to Sexton Blake’s Batman. Blake also has his faithful bloodhound Pedro to help him out. While they may have been aimed mostly at a juvenile readership the best Sexton Blake stories are both clever and entertaining. Stories like A Case of Arson and The Black Eagle are fast-paced and action-filled and generally great fun. E. W. Hornung is best remembered today for his many tales of the great gentleman thief Raffles, and for being Sir Arthur Conan Doyle’s brother-in-law. Hornung was however quite a prolific and successful author on his own account and created several other equally interesting crime fiction heroes, including Stingaree the Bushranger (inspired by Hornung’s two years in Australia) and The Crime Doctor. It is the Crime Doctor with whom we are concerned at the moment. The Crime Doctor is Dr John Dollar, a medical man who dabbles in crime-solving. As a young man he had suffered a serious and almost fatal head injury and had been cured by a brilliant Swiss surgeon. The head injury had caused him not just great distress but had effected unpleasant personality changes. The Swiss surgeon’s operation restored him to health and normality. This experience of personal medical crisis made Dr Dollar an even more compassionate man with a personal understanding of psychology, both normal and abnormal. Dr Dollar is a true medical detective, a man who uses both his skills as a detective and as a doctor to solve his cases. 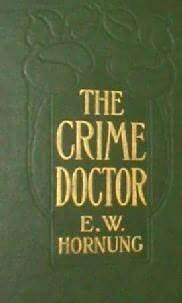 In 1914 Hornung published a volume of short stories featuring Dr Dollar under the title The Crime Doctor. I’ve so far only tracked down one of these stories, in a vintage crime anthology. The story is A Schoolmaster Abroad. On holiday in Switzerland Dr Dollar makes the acquaintance of a young man named Jack Laverick. Laverick had been an amiable young man who had done well at school before going up to Oxford. He was popular and he was a devoted and dutiful son. All this changed when he was injured in a toboganning accident. He become morose, irresponsible and a drunkard, the despair of his parents and of his long-suffering tutor, a schoolmaster from Eton. This behaviour change provides the medical challenge for Dr Dollar, but there is a criminal matter that has also attracted his attention. Someone has tried to kill young Jack Laverick. Even worse, suspicion has fallen upon the very doctor who had saved Dr Dollar’s life years before. This doctor appears to have prescribed a fatal dose of strychnine for his young patient. Dr Dollar will have to find solutions to these two problems, problems that may or may not be linked. It’s an interesting and unusual detective story, written with Hornung’s customary easy style. It’s a story that is worth seeking out if you’re a fan of offbeat crime fiction. As for myself, I will now be looking out for a copy of the Crime Doctor short story collection. 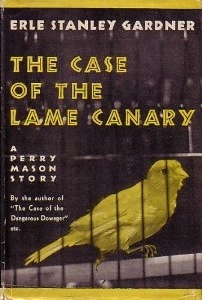 The Case of the Lame Canary is a relatively early Perry Mason mystery by Erle Stanley Gardner, published originally in 1937. It starts with a woman carrying a canary in a cage offering Mason the kind of case he never accepts - a divorce case. But there is one thing that bothers Perry about this case - why is the canary lame in his right foot? It’s the sort of trifling detail that really gets under the skin of a good detective. Perry just has to find out the answer to this question, so he takes the case. The woman who brought the canary to his office is not actually his client - it’s her sister he will be acting for. At first it seems to be a depressingly sordid tale of domestic intrigue, but that’s before the murder is discovered. There may or may not be a witness to the murder - a man who may or may not be suffering from traumatic amnesia who may or may not even remember what he saw. Nobody knows exactly what it was that this man did see, but everyone is sure it was important. Perhaps even as important as the lame canary. Gardner’s gives us the sort of fiendishly twisted plot that devotees of golden age crime fiction dote on, and those devotees will not be disappointed. As usual Perry Mason sails very close to the wind legally speaking. Nothing he does is quite illegal (or at least could be proved to be illegal) but many of his methods would raise eyebrows at the Bar Association. But then Perry Mason is accustomed to raising eyebrows at the Bar Association. The Perry Mason novels belong to that subclass of crime fiction in which the detective hero himself is as entertaining as the mysteries he unravels. Fans of the immensely popular 1950s Perry Mason television series will find that the Perry Mason of the books is a slightly more glamorous and distinctly less reputable figure than the television version. Not that Perry Mason would ever do anything that was actually crooked - he just enjoys upsetting the police and as he himself says his style in court is to throw legal monkey wrenches into the machinery of justice at every possible opportunity. 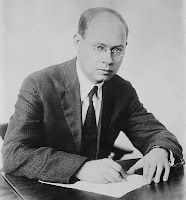 Erle Stanley Gardner (1889-1970) received virtually no formal legal training but taught himself law and passed the California bar examination in 1911. 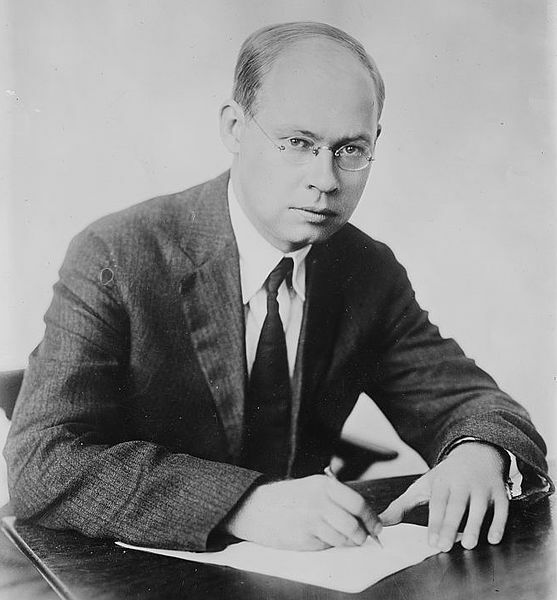 He divided his time between the practice of law and the writing of crime fiction for the pulp magazines until the early 1930s when the success of the early Perry Mason novels allowed him to devote himself full-time to writing. The Case of the Lame Canary is classic golden age detective fiction and is highly recommended. 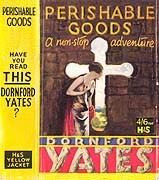 Perishable Goods, published in 1928, was a sequel to Dornford Yates’ very successful 1927 thriller Blind Corner. Once again Richard Chandos and his friends are up against master criminal “Rose” Noble. “Rose” Noble has kidnapped Jonathan Mansell’s cousin Adele. His real agenda is to get revenge on Mansell and to get some of the fortune that Mansell, Chandos and George Hanbury stole from under his nose in Blind Corner. As an added complication, Mansell is in love with Adele, who is married to his cousin “Boy” Pleydell. This fact is known to “Rose” Noble and he makes use of this knowledge to put further pressure on Mansell. Perishable Goods follows the formula of Blind Corner very closely, with a chase through Europe culminating in the siege of a castle in Carinthia in Austria. While Mansell, Chandos and Hanbury are the heroes they can be pretty ruthless as well. They don’t believe in letting the police interfere - they prefer to take the law into their own hands and to deliver exemplary justice to evil-doers. Since their Rolls-Royce cars are equipped with secret compartments loaded with weapons they’re in a pretty good position to do so. The weakness of these thrillers is perhaps the fact that Mansell is a bit too clever, and the hero-worship of him by Chandos (who narrates both novels) gets a bit tiresome. There are plenty of narrow escapes, a considerable amount of blood-letting and extensive and quite skillful use of the castle location, with secret passageways and trapdoors. It’s exciting, but not quite up to the standard of Blind Corner. While they don’t compare in quality to the thrillers of Sapper and of John Buchan from the era, or of Edgar Wallace’s thrillers, Dornford Yates’ novels are still good examples of the British literary thriller of the interwar years and Blind Corner is certainly worth tracking down. If you’re going to read Perishable Goods you really must read Blind Corner first. Dornford Yates was the literary pseudonym of the prolific English author Cecil William Mercer (1885-1960). He wrote eight thrillers featuring Richard Chandos as well as a series of humorous novels that interestingly enough featured many of the same characters who appeared in his thrillers. 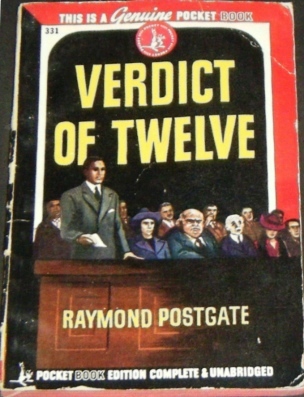 Raymond Postgate’s Verdict of Twelve was enthusiastically recommended by Raymond Chandler in his famous essay The Simple Art of Murder, so of course I had to track it down and read it. And it has to be admitted that it takes a very original approach to the mystery genre. The book was originally published in 1940. Postgate had been a communist in the 30s (a sort of Oxbridge champagne socialist) and remained a socialist for the rest of his life. He has a reputation for having given a political spin to the handful of mystery novels he wrote, but mercifully that tendency is unable to ruin what is a rather fascinating novel. Its most unusual feature is that it focuses on the jury in a murder trial. We get a potted biography of each juror, and a strange collection of people they are (including an unconvicted murderess). That takes up the first third of the book. We then move on to the actual plot, a murder that may or may not actually be murder. An eleven-year-old boy named Philip lives with his aunt and guardian, Rosalie van Beer. She is an extraordinarily unpleasant woman and does her best to make Philip’s life a misery. This culminates in the extraordinarily cruel killing of the one thing Philip loves, his pet rabbit. Shortly afterwards Philip becomes ill, and within a short space of time he is dead. Rosalie had a very strong motive for killing him - he was all that stood between her and a very considerable inheritance. Added to her general viciousness it’s not surprising that foul play is suspected, especially in view of the very unusual circumstances of Philip’s death. All this occupies the second third of the book, after which we move on to the trial. Now the focus is back on the jury, and on the very long process by which they eventually reach a verdict. Rosalie van Beer was a nasty piece of work, of that there is no doubt, but does that necessarily make her a murderess? The evidence is compelling, but entirely circumstantial. When they start their deliberations it is obvious that even after hearing all the evidence most of the jurors still have no idea what their verdict should be. The dynamics of the jury room and the complicated interactions of the twelve rather unsatisfactory jurors will decide the issue. It’s certainly an unusual approach. Most mystery novels end with the arrest of a suspect and disregard the trial altogether. Those that do deal with the legal processes (such as Erle Stanley Gardner’s Perry Mason legal mysteries) tend to concentrate on the personalities of the lawyers involved. Juries are simply twelve faceless persons. 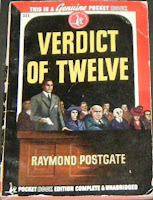 Verdict of Twelve reminds us of what a curious animal a jury is. Apart from its originality this novel also has a strong plot that keeps us guessing until the end. Every reader will undoubtedly have formed certain conclusions, but it is impossible to be sure that those conclusions are sound. For one thing, just as in a real murder case, we have to judge the case ourselves based mostly on the evidence that is brought forward at the trial and we know that our information is incomplete. Verdict of Twelve presents us with many vivid characters, almost all of whom are to some extent unsavoury. This is not an optimistic mystery novel - it does not lead us to believe that a verdict in a trial has anything to do with truth or justice. Despite this it’s an entertaining book and its very unconventionality makes it more or less a must-read mystery. You might not approve of its approach but it’s worth giving it a chance.